Once the guest list and budget for a wedding has been established, the next step for most wedding couples is the selection of the wedding venue. Selecting your wedding venue means that a big piece to your wedding puzzle has been secured in place and you are ready to move on to the other planning tasks ahead of you. While wedding venues may differ in terms of location, style and set up, there is definitely a set list of questions to ask venue for events. You will want to be aware of these questions to ask a wedding venue so that you are on top of all details in advance of your actual wedding day. Asking these questions and ironing out the details during the planning process will help to ensure an organized, seamless, and magical wedding experience. We put together a helpful list of wedding venue questions to ask your venue contact. What time can my vendors arrive at the venue for set up? It is super important for vendors to receive specific setup instructions from the venue. The first step should be putting your vendors in touch with your venue contact so that they can introduce themselves if they haven’t worked together in the past and then discuss the details for your wedding. Vendors will need to know in advance of your wedding day what time they are allowed to arrive and begin their setup for a wedding. You may wish to assist your venue and vendors in creating a timeline for the day of your wedding. This can easily be done within AllSeated. 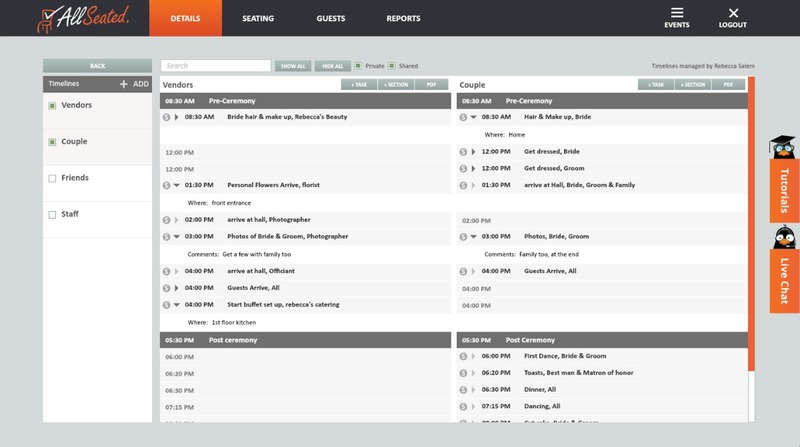 A vendor timeline will allow your vendor team to collaborate in realtime on set up information and details so that everyone is operating on the same page from the start of the planning process. Who is my day-of contact at the venue? The day-of wedding venue contact may not be the person you worked with throughout the planning process which is something most wedding couples don’t realize in advance. You will want to ask in advance of your wedding day who your venue’s day-of contact will be. If your wedding will be handed off to someone new for the day of the affair, try to schedule a time to meet with this person to review your details and ensure you have a day-of contact phone number for this person, not just for you but for your vendors too! Can I drop off important items at the venue prior to my wedding day? Do you have a place to store my belongings? To lighten the stress load on the day of wedding, many wedding couples choose to drop off favors, ceremony items and other belongings in advance at the venue. Wedding venues can often accommodate this need by providing a safe place for you to store your things in the days leading up to your wedding, if you ask. It is important to ask in advance of your wedding day just in case the venue needs to make accommodations for your items, clearing space and making room for what you need to leave in advance of your wedding. How and when do you receive final payment? What if guests I already paid for don’t show up for the wedding? It’s wise to discuss the wedding venue payment schedule and structure early on in your planning process. You will want to understand and be aware of how the venue wishes to receive their payments so that you are financially prepared for the day of your wedding. Wedding venues will each have their own policies when it comes to no-shows so it’s best to knock out these conversations in advance to avoid any surprises. Will I have access to a bridal room? Access to a bridal room may prove critical in your personal day-of wedding timeline. This is an important question to ask wedding venue as knowing if you have access to a bridal room will allow you to plan where you want to get ready (think hair, makeup dress). Even if you are planning to get ready at another location, access to a bridal room during your wedding may be beneficial as it gives you a place to store personal items and a location to use as changing room, or even to just take a breather! Armed with this list of questions to ask wedding venue, wedding couples are best able to plan their wedding in an organized manner while avoiding big surprises.